An unprecedented event took place in the European Parliament. On the margins of the ongoing EU summit, new investigative material concerning the tragic incidents that took place in Maidan in 2014 were presented. In the conference under the title „Maidan revolution 4 years later“, hosted by MEP Bill Etheridge, attended by representatives of many human rights organizations, media and European parliamentarians. There was present also the Scottish MEP David Coburn, and Latvian MEP Miroslav Mitrofanov who showed special interest in presentation invited all the speakers to his office to discuss possible means of action. The meeting was opened by Anne Steffen, an Israeli investigative journalist, who come to Brussels to present video material that sheds a whole new light on the tragic events that took place in Maidan. 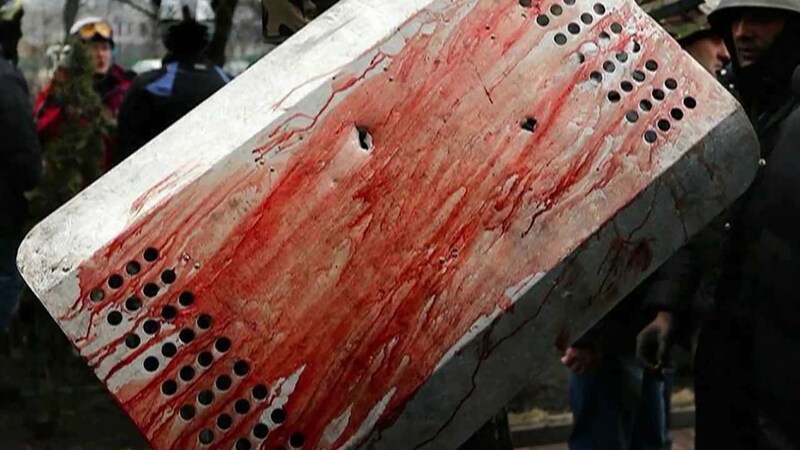 Over the last four years, the Ukrainian authorities have perseveringly spread the theory that it was former Ukrainian authorities who were responsible for the murders on the Maidan. We were told that they opened fire on protesting people and killed more than one hundred of them in cold blood. The terror of this imaginary image, strengthened by the reluctance towards the former Ukrainian government, quickly gained strong support from many European politicians. A beautiful legend of the beautiful legend about Maidan, where the blood of „fighters for democracy“ was spread directly to the stars of the European Union flag, made the EU even close its eyes to the systemic corruption of the current Ukrainian government and rampant right-wing radicalism. However, the time has come to open the eyes of European politicians on the uncomfortable truth about what really happened in February 2014 on the Maidan square. The materials presented in the European Parliament unequivocally suggest that more than one hundred people who died on the Maidan were victims of the monstrous provocation done by leaders of opposition, who used those deaths to grab the power in the Ukraine. This event was unique for many in many reasons. For the first time in the heart of the European Union, the shocking films of Israeli journalist Anna Stephan and Italian reporter Gian Micalessina were presented. These materials clearly point to the fact that the opposition leaders who are today in prominent places in the Ukrainian authorities played a significant role in the killings that took place in Maidan. The presentation had a profound impression on everyone, to such an extent that during the discussion the idea of setting up a special EU commission, that would supervise and coordinate the murder investigation that took place in Maidan, was raised. Ukrainian lawyers Alexander Goroshinsky and Olga Prosasyuk also took part in the conference, who provided facts of persecution and pressure on lawyers by the Ukrainian authorities on these cases. From the conversations that took place in the corridors, it appears that in the coming days a draft resolution will be prepared on this matter. Initial support directly after the presentation was announced by a group of 5 MEPs from different EU groups. Everything indicates that presentation of new facts about the assassinations that took place in Maidan will have a key impact on the further course of the investigation and may trigger a radical change of European institutions towards the Ukrainian authorities, which despite the tragic incidents have already passed over 4 years, were unable to complete the ongoing investigation or punish those who are responsible. Today, after more than 4 years the truth comes to light and Europe cannot continue to neglect or ignore no longer human rights violation in Ukraine.